Chairman of Chinese e-commerce giant Alibaba Jack Ma spoke to 3,000 students in Hanoi on Monday afternoon with the aim of inspiring entrepreneurship among young people. Having landed in Vietnam at the weekend, Ma said while walking on the street in the evening, he was "inspired because there are so many young people in this country." "They smile, they are energetic, they play all kinds of games," he told the audience at the Vietnam National Convention Center. "I wonder why people in Vietnam are so happy. One reason, you're young," he said, responding to the questions posed to him in English. Sharing his recipe for success, Ma said: "Lots of people today learn from success. To succeed, there're lots of reasons. To fail, there're just a few. We have to learn why people fail. We study failures and try to avoid them. You learn from mistakes, not because you can avoid them, but because you learn what you will be when you experience mistakes." "I heard there're some books about me in Vietnam that are very popular. I don't read them because in the future I want to write a book about myself, something like Alibaba's 1001 Mistakes," he said. "If you learn from mistakes, you'll be stronger, more realistic. You see all the mistakes, the failures, and you still want to fight for the future." "It is not the success but the moment I failed that shaped me. This makes us even stronger." Asked about his record of being rejected, Ma said it might have been his destiny to build the Alibaba empire. "When I was rejected, I felt sad. I couldn't tell my parents. Then I thought God didn't want me to join a company; he wanted me to build a company myself," he said in response to a question from the moderator. "There’s no option, no chance, that’s why today I spend a lot of time with young people and students and tell them that how I got through. Go back home, sleep, tomorrow, try again. "There’s no choice. Let me tell you, 80 percent of people in this world have the same thing. If Jack Ma today wasn't CEO of Alibaba, like nobody, nobody would read my story. Because we founded Alibaba, people see you’re good. [But] we’re the same. "The only thing I do is never give up; most people give up. If you give up, no chance. If you don’t give up, you still have a chance." 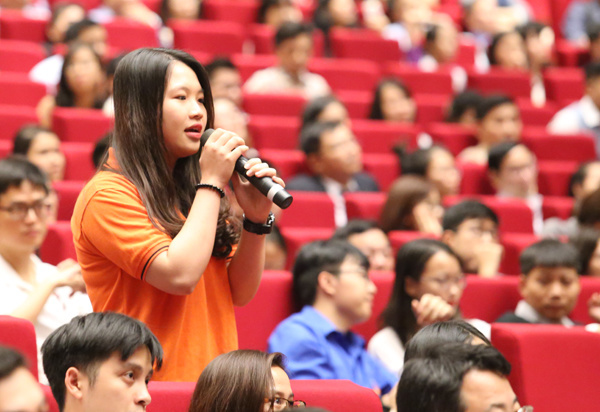 A student poses a question to Jack Ma. To Ma, teamwork is something he prizes above all else. "When my company was small, I asked my colleagues. When my company got bigger, I asked my colleagues. Today when my company is much bigger, I ask my colleagues. This is teamwork," he said in response to another question from the audience. "When I have problems, I ask my team. I never hide anything. Everything I know, I share with my team. And I hope if my team have problem, they will ask me. We discuss openly and frankly. "Today is different. Our size last year was almost as big as the number 31 [largest] country in the world. When it’s so big, there’s no place I can learn so I read books, travel around the world, meet leaders, businessmen, artists, talk to them, listen to them and share with my team. "Over the past 18 years, I've never thought of committing suicide [when faced with failures]. There’s always a way out, always a solution for the future and tomorrow. You may not have it, but you have to find it out with the team. "Earlier on Monday, the world's most inspirational billionaire, according to Fortune's 2017 "World's Greatest Leaders" index, spoke at the Vietnam E-Payment Forum of his experiences in e-ecommerce and mobile payment, and how lessons from China can be applied in Vietnam. "Like it or not, the world is moving to a non cash payment era," Ma said. "When society is a cashless society, everything is digitalized, everything is transparent. No one can run away." On starting your own business, Ma said: "The first thing is not the money. It's the idea, the thing that others can't do. You have a good idea, money will come, good results will come." "When you want to become an entreprenuer think about what you will sacrifice," he added. At a meeting with Prime Minister Nguyen Xuan Phuc this morning, Jack Ma said he will consider establishing a store for Vietnam on Alibaba’s e-commerce app. jack up the price meaning?